Light, refreshing and aromatic, this simple yet stunning asparagus tart with fresh herbs makes a stunning appetizer for brunch and parties! 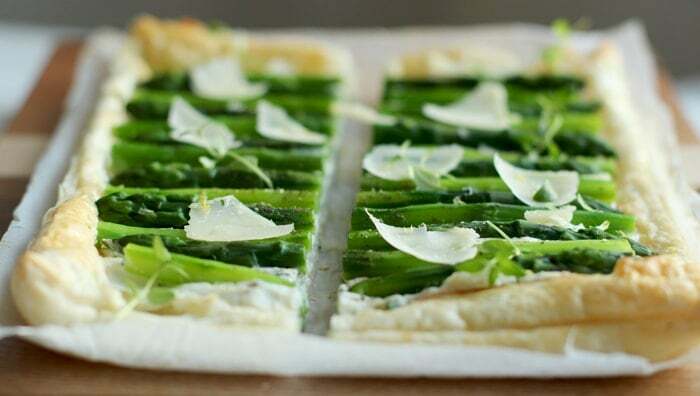 You won’t believe how quick and easy this asparagus tart is to put together. Ready in less than 30 mins, packed with awesome flavours and colors, to make this tart all you need is 5 ingredients: fresh asparagus ( surprisingly, they’re still in season! 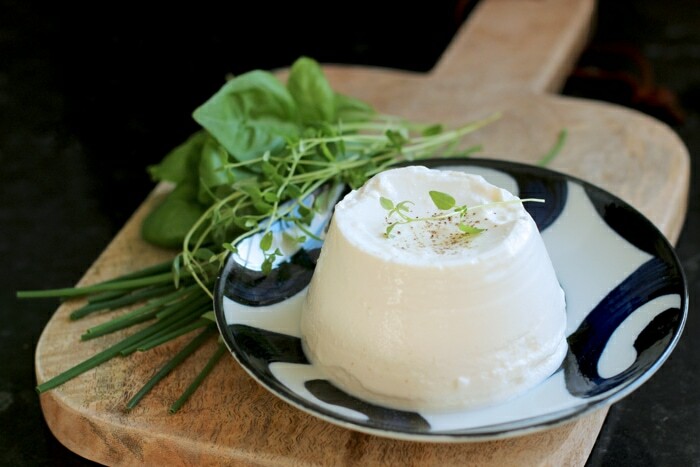 ), organic ricotta cheese, a bunch of fresh aromatic herbs, a sheet of puff pastry and good-quality fruity Extra-virgin olive oil. 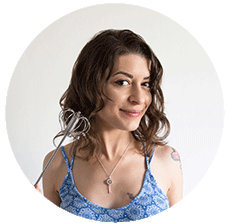 Ricotta is hands-down one of my favorite cheeses and I literally use it for anything from my famous tempura pasta, to healthy cheesecakes. Mixed with a bunch of fresh herbs such as chives, basil, lemon thyme, and zingy lemon zest it makes the perfect summery filling for this tasty tart. Sweet and tangy, delicate and aromatic, this refreshing cheese mix can be used for SO many different recipes. Spread on bruschette and crostini, make a light cannelloni/lasagne/tortelloni pasta filling, or simply serve as a dip along some crunchy fresh veggies. I prefer asparagus slightly soft but still firm and crunchy, so I usually blanch them only for a couple of mins. 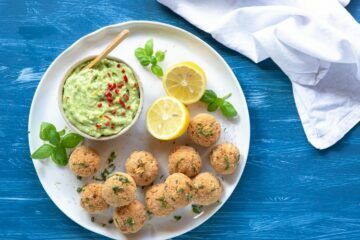 Cook, then drain and quickly transfer them into a bowl of ice cold water, to stop the cooking process and preserve their eye-catching bright green colour. 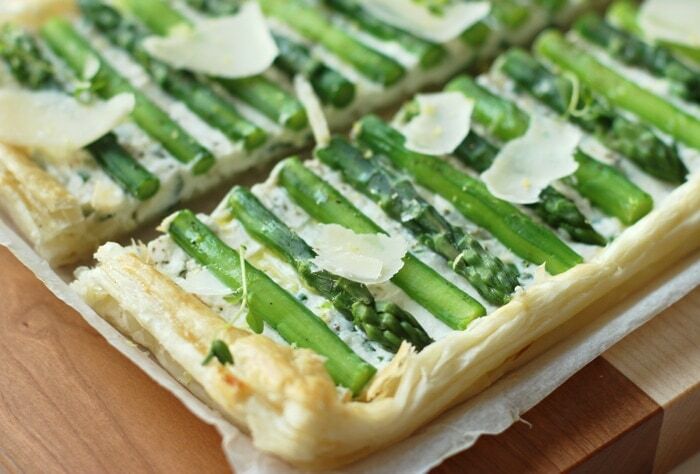 Top the tart with the asparagus alternating the tips, it’s a simple easy but pretty way to arrange them. While insanely good, puff pastry can be quite a labor-intensive thing to make in the kitchen. If you’re not up for the challenge, buy a very good store-bought version. 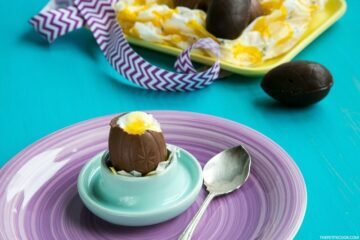 It should only have butter, salt, flour, water and lemon juice in the ingredients list, and it’s a good reliable choice for a last-minute prep. If you have a little more time however, it’s best to make your own puff pastry. I always use Gordon Ramsay’s rough-puff pastry recipe, it’s quick, easy and never fails to deliver great results! To make sure your puff pastry is evenly cooked, bake the base for 15 mins before adding the rest of the ingredients. Then you can evenly spread your ricotta cheese mixture on the tart, top it with the part-cooked asparagus, and put it back in the oven for an extra 10 mins. Serve it warm or slightly cooled, but believe me this tart is better after a couple of hours in the fridge, or even the next day. This asparagus tart makes regular appearance on my table, especially on meatless mondays! If you want to make it 100% vegetarian, simply substitute butter in the puff pastry recipe with homemade vegan butter, or store-bought alternative. Easy to plan ahead, this light and herby asparagus tart is a fantastic addition to any summer barbecue, party, brunch or picnic! Roll out the pastry to about 6 x12inch (15 x 30cm) rectangular shape and trim the edges. Transfer to a baking tray covered with parchment. Score a 1cm border, making sure you don’t cut the base. Prick the base with a fork, brush the tart edges of the olive oil ( or a beaten egg). Bake for 15 min, in the oven middle rack. In a large pot of boiling water, quickly blanch the asparagus for 2 mins, then drain and transfer into a bowl of ice cold water, Drain and pat dry, keep aside until needed. Meanwhile, prepare the cheese filling. 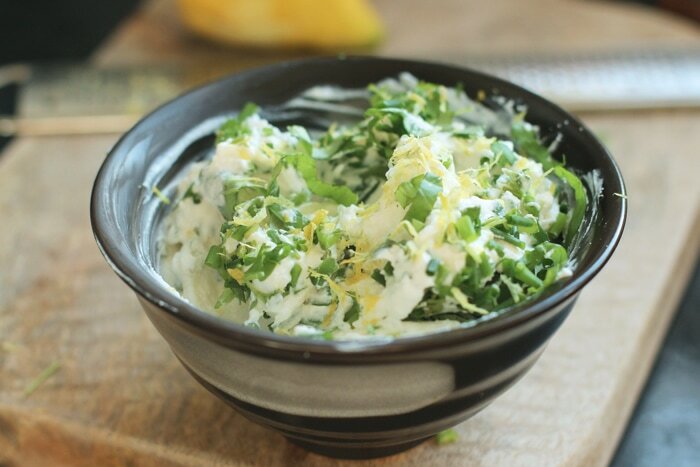 In a bowl mix the ricotta, lemon zest, herbs and the Parmesan if using. Drizzle with very little olive oil and season with salt and freshly cracked black pepper. Remove the base from the oven and evenly spread with cheese mixture within the borders. 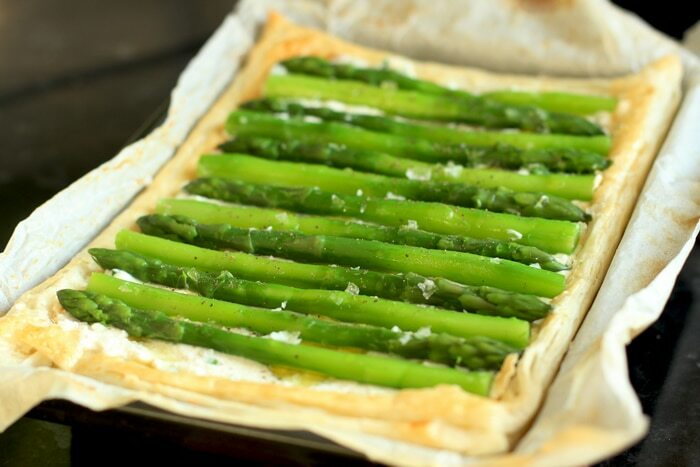 Place asparagus along length of the tart, alternating the direction of the tips. Drizzle with a little olive oil, season with sea salt and black pepper and bake for 15 mins more. Serve warm or slightly chilled. Refrigerate in an airtight container for up to 2 days. Enjoy! To make your homemade puff pastry 100% vegetarian, substitute butter with vegan butter. 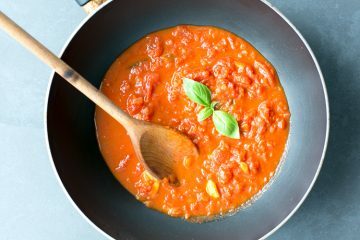 If using store-bought version, buy a vegetarian-friendly alternative.